The dimensions of the Traviso are: 760 x 670 x 250mm. 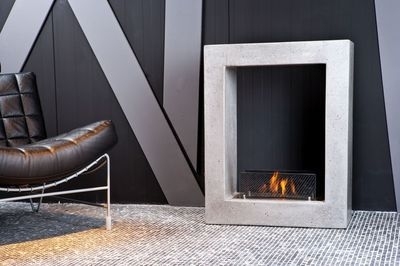 The Traviso is part of our new range of lightweight concrete effect fires. The Traviso is a bioethanol fire that uses our unique ceramic burner. The advantages of this system over open trough bio ethanol burners are as follows: 1) Controlled release of the bio ethanol fluid, which extends the burn time of 1 litre of bio ethanol and therefore reduces the running costs. Our bio ethanol contemporary fires, burn bio ethanol producing no smell or smoke unlike a gel fire which burns gel fuel. Gel fires do smell and leave behind a residue in the combustion chamber. The benefit of bio ethanol over gel fuel is that it allows you to sit around the fire without the usual inconvenience of smoke, a complaint of chimeneas and wood buring stoves.The fire is lit with an extendable lighter and extinguished using the sliding mechanism so you don't have to stick your hands in the flames. 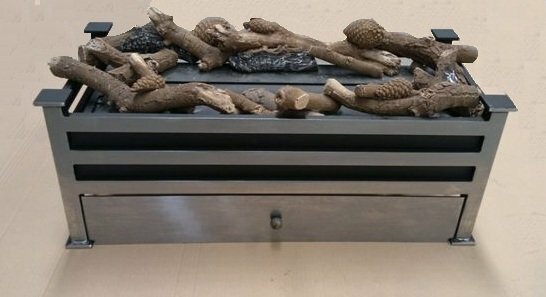 This fire pit can be dressed with logs, pebbles or our unique Black Diamond material.